LSU on-campus printing is available from a lab computer or from your laptop or mobile device. (Large-format printing is available.) The ITS Print Desk is located on the 3rd floor of Middleton, directly in front of the stairwell. The Computer Lab is located on the first floor of Middleton, turn left when you walk into the library. Print services includes the Pay-for-Print systems in the ITS Computer Labs and other locations across campus. These are printers and print job release stations managed by ITS. You can print your documents in the lab and use your Tiger Card or Geaux Card to pay for the printouts by using the release stations. In addition, you can install the printers to your laptop and print. You will still go to a release station to use your Tiger Card or Geaux Card to release the print job. Jobs are held for 90 minutes. Available To: LSU Faculty, Students, and Staff. Requirements: Must have a PAWS ID & a Tiger Card, and funds on the Tiger Card to pay for printing. Restriction: The print lab has 3-foot wide paper rolls. Files in which both the height and width dimensions are bigger than 3 feet CANNOT be printed in these locations. Faxes handled by the Print Desk are outgoing only. LSU has two Computer Lab locations that house computers and printers. Anyone with a valid PAWS ID can use the lab, anyone with a Tiger Card can print. Also, your Tiger Card must have funds on it to be able to print. For more Tiger Card information, visit the Tiger Card Web Site. 1. Bring your Tiger Card and your print job to the Lab Monitor on duty in the lab where the original document was printed. 2. The Lab Monitor will verify that the print job was done in that computer lab, and re-print at no additional cost. 3. If your account was charged for more pages than were meant to print, the Lab Monitor on duty can submit a Tiger Cash refund request on your behalf. Refunds can take up to 1 month to be applied. The Public Printer Labs have 3 types of Printers available: Normal Format Printer, Large Format Printer, and Custom Format Printer. What is the Maximum Size that can be printed in the ITS Computer Lab OR at the ITS Print Desk? Maximum Page Size: There are 3 foot wide paper rolls available at the Print Desk in Middleton. What Custom Printing Services are available in a Computer Lab or at the ITS Print Desk in Middleton? 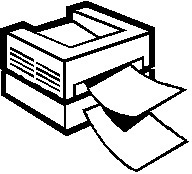 Middleton Library and the Union can send faxes both locally to the Baton Rouge (225) Area Code and long-distance. Outside of the 225 Area Code: Visit Union Services on the LSU Union web site. *NOTE: Faxes handled by the Print Desk are outgoing only. How do I print from any computer without bringing the computer to the LSU Campus? What if I have a project on another computer that I need to print? Save your Project on a Flash Drive or USB Drive. Flash Drives are available for use by current LSU Students in the Middleton Computer Lab, located on the 1st floor of Middleton. What if I am not an LSU Student or I do not have a Tiger Card or Student ID? Can I pay to print in the Computer Labs or ITS Print Desk in Middleton Library? Yes, you can. Just purchase a temporary Tiger Card for $1.00 from the Tiger Card Kiosk in the Current Periodicals/News Paper Room 126, then deposit money onto your Tiger Card by either visiting the Tiger Card Office or a Tiger Card Kiosk. Can I set up wireless printing in my office/dorm room? No, ITS does not allow individuals to set up wireless printing in office / dorms rooms. When are the Computer Lab & Print Desks open? What are the Hours of Operation? For a current listing of hours of operation, call 225-578-7554.